♦ Barriers to Growth in your Organisation? Design Thinking can help. Choose one of these in your business that would make a real difference for you if it was resolved/actioned. Design Thinking can be applied to a product, process, service or strategic need. You will see some examples overleaf. Bring together a cross-disciplinary team of 3 or 4 employees who are mandated to come up with a validated concept in 6 weeks! Include people from Technical, Finance, Marketing, Operations or HR etc. 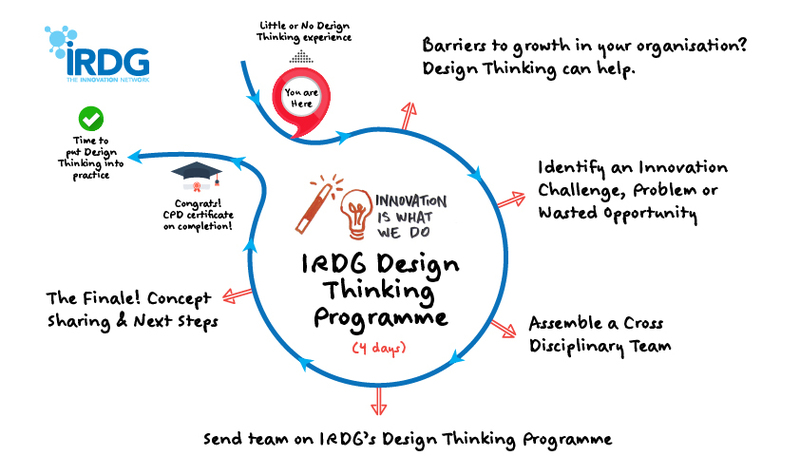 Team participates in IRDG’s Design Thinking Programme, over 4 days, based around a project, featuring a 2-day residential high activity session in the middle. Day 1 – Introduction to Design Thinking, Visualisation, Getting started, Design Research methods, Techniques for identifying needs and insights. Hosted by Broadlake. Days 2 & 3 – Research findings, Synthesising insights, Reframing the vision, Ideation and creative idea generation, Creating concept boards, Assumption mapping, Prototyping and iterations, Business case. Venue: Killashee House Hotel. Teams are encouraged to bring their business leader(s) to the finale to explore the final concepts, and possible next steps and to see design thinking applied in practice in Design Partners. Day 4 – Design in business (case study), Project presentations and discussions, Peer review and key takeaways. Hosted by Design Partners.